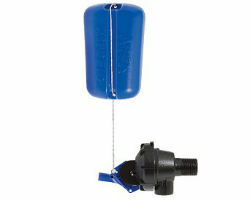 Patented self cleaning valve mechanism to minimize blockage. Armless to reduce damage to the livestock. Full flowdiaphragm activated. Bottom or side mount. Above water float adjustment. Float buoyancy equal to 6" round float. Cord cleat for shutting off valve. 1 ½” water level differential from open to close. Maximum inlet pressure 175 PSI. UV stabilized and corrosion resistant.